To start, let it be known that I do not believe that the following is what will occur within the game of baseball. It is simply what I believe to be the best course of action for the financial status of the league, along with the best course of action to achieve a better league. I want this to happen, but I do not think it will. the MLB Trade Rumors forums, there have been some discussions on baseball’s league and division formatting. People have stated displeasure with the 16-14 setup that is currently in place between the two leagues (16 teams in the NL; 14 in the AL). For some, they propose the league simply move a team over. However, that isn’t exactly a feasible solution. As of now, baseball is a daily sport. Mondays and Thursdays are the only time that teams are consistently off throughout the year. Because of that, there are 15 games scheduled 5 days of almost every week. If the leagues were 15 teams each, then who would play the fifteenth teams each day? An odd number of teams will not work in a game that requires two teams to play. It would require considerably more doubleheaders or expanded interleague play to the point of almost one game per day. Since that idea has been mostly established as not being feasible, there are two other options: expansion or contraction. Being the cynic that I am, I elected to handle the contraction article, and WAMCO is working on his own piece in favor of league expansion. In either instance, the idea is to add or subtract two teams, in order to set the American and National leagues on an even playing field in terms of team count, either at 16-16 in a 32-team league or 14-14 in a 28-team one. Now this is not going to be a simple matter. To determine which teams would best be contracted, we will have to look at a variety of factors. For starters, the team’s popularity has to be considered. Even though the Yankees are a huge payroll with pinstripes, removing them would not be an option because they are also an enormous source of income for the league, which also means more for the other teams in revenue sharing. Of course, winning is a large factor as well. Though the Rays might not even be drawing 20,000 fans per game, they have done an excellent job of building a winner through the scouting and player development departments. To reward an ownership group with playing the game the right way and succeeding with a giant axe in the back would be crazy. Team history is also a factor. When comparing a constant loser like the Pirates to the Padres, the team with the 18-year streak of losing seasons might be the easy pick. Still, Pittsburgh has a rather rich baseball history, so just pulling the rug out from under that team might not be the best idea. When it came down to it, I saw a lot of potential teams. For the sake of time and sanity, though, I elected the commonplace method of examining five teams is the best way to go. I’ve considered several portions of a franchise when I determined if it should be in the final five to be considered for removal from the league. When it came down to it, my personal preferences went to these teams: The San Diego Padres, the Florida Marlins, the New York Mets, the Pittsburgh Pirates, and the Cleveland Indians. Before we begin, though, let us cover all of our bases. I am sure there will be fans of some teams that think my choices are without merit, but those questions will be answered in the main portion of the article. Meanwhile, those same fans will start to throw other teams under the bus, suggesting that they are more deserving of a boot. I will quickly voer those teams, just to put those complaints to bed beforehand. New York Yankees: As I said, it is irrational to think that probably the biggest economic draw in the league would be an option, but many fans have a dire hatred for the way the Yankees operate. That is not their fault, though, as they are well within the league rules, and they feed back into the revenue sharing pool with the huge attendance and merchandise sales. Tampa Bay Rays: The lack of a crowd draw for a playoff team is almost inexcusable, but they are winning, and how can we really fault them for that? There are plans for a new stadium in the next 3-5 years or so, meaning that the attendance woes will likely lessen over time. Building around young talent, such as center fielder Adam Jones, has kept Baltimore off of the hypothetical chopping block. a great core of players, including Brian Matusz, Adam Jones, Nick Markakis, and Matt Wieters. They have also been showing a willingness to spend on a big free agent that could change the franchise, such as their efforts with Mark Teixeira before ye got Yank(e)ed away. 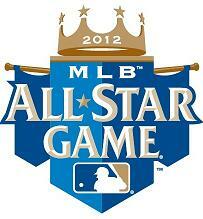 Houston Astros: My plan was to only cover NL teams, but I thought that a bit harsh. They were the fifth NL club I considered, but they have done a good job in the fairly recent past, and IO would like to see how they do in a rebuilding effort. Arizona Diamondbacks: There were thoughts with this team as well. I think that having a professional team near a spring training site is desirable as well, and the team has some young talent. Also, their last World Series was fairly recent. Washington Nationals: Ultimately, I felt that this team is just in a good location. Having America’s pastime in its capitol is almost a requirement, I think. Like Baltimore, they have started to build a young core of talent. They were also willing to spend on Adam Dunn, and still might. Chicago Cubs: As a Cubs fan, this suggestion baffles me. I had someone on the forums mention that the Pirates were not a reasonable choice because of their losing, but that the Cubs are more logical because of their World Series drought. Granted, part of the omission is probably my bias towards my team, but that is a small factor. They have the oldest park in the game, so they clearly are not drawing money from taxpayers like teams that have recently erected new homes like the Yankees, Mets, Cardinals, and Twins. Even without being a title contender in a while (2007 and 2008 were major disappointments), the team draws one of the top-10 largest crowds each year, if not top-5. The farm has improved of late, and they have a new owner, so I see good going forward. There are my defenses for those teams. In Part 2, I will cover the main idea of my post, so stay tuned. EDIT: Part 2 is up. As any baseball fan can (hopefully) tell you, the Texas Rangers are going to the World Series for the first time in the 40+ years of their franchise, now led by pitching great Nolan Ryan. They overcame an enormous payroll discrepancy, the dreaded Yankees offense, and what seemed like a mess of rigged umpire calls (simple physics would tell you that ball hit Swisher). 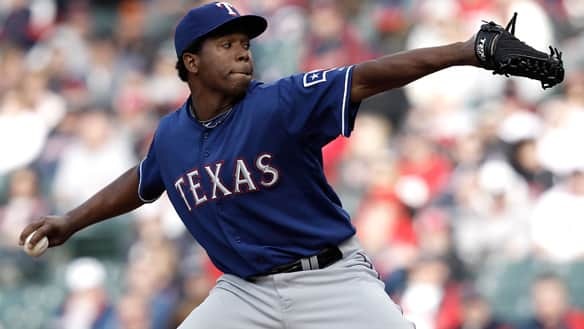 22-year-old Neftali Feliz sealed Texas' first World Series birth with a perfect ninth inning on Friday. Doing such a thing is no simple feat. Every year, fans of each and every team try to think of reason why they can make the World Series and why others cannot. This year, we have the Rangers taking the place of the 2008 Tampa Bay Rays, being that team that survived the Seattle Mariners’ offseason spending spree and the constant questions of their rotation while building a team on prospects and cunning. Rather than go out and buy themselves a team, they built one. This whole process took them from the days for Alex and Ivan Rodriguez and Rafael Palmeiro to the days of Josh Hamilton and Neftali Feliz and Michael Young. Over the years, we saw Texas move A-Rod for Alfonso Soriano, and Soriano for a pittance whose best piece is on Detroit (Armando Galarraga). Palmeiro became a PR lightning rod after his career because of his being linked to steroids. Pudge went on to win a World Series with the Florida Marlins. One man who gave Texas a big return on its investment was Yankees first baseman Mark Teixeira. Teixeira was taken fifth in the 2001 MLB draft by the Rangers, and he made his major league debut in 2003. After a somewhat mediocre 2003 season (.259 average, 26 HR, 102 OPS+), Teixeira exploded. From 2004-2006, he managed to hit .288 with 114 HR and a combined OPS+ of 134 , all while winning 2 Silver Sluggers and 2 Gold Gloves. But, as is the case with mid-market teams, a long-term future wasn’t meant to be. Texas offered its star an 8-year, $140 million extension, but Big Tex said no (he later got 8 years and $180 million from the Yankees). As a result, Texas jettisoned him to Atlanta in July of 2007. Their return? Jarrod Saltalamacchia, Matt Harrison, Beau Jones, Neftali Feliz, and Elvis Andrus. What have those four done since moving to Texas? Well, quite a lot, actually. At the time, Saltalamacchia was seen as the prize of this deal. He was a catcher with power and a strong arm, but it was simply not meant to be for him, it would appear. After appearing to be a rising star in the Atlanta system, Salty began having issues with his throwing shoulder, to the point where even getting the ball back to the pitcher became a journey. He was recently sent to Boston in return for three prospects, making him look like a relative bust in the blockbuster trade. Matt Harrison has struggled in his time in the majors, managing a feeble 5.39 ERA over three seasons. As of 2010, Harrison has been made into a reliever, though he made 6 starts for Texas this season. He has not been on the postseason roster for Texas. Beau Jones has been off and on in the Texas organization, but his 2010 in AA seemed to show some promise. The 24-year-old lefty struck out 62 over 52 2/3 innings, with an ERA of 2.91 and a WHIP of 1.27. He could be bumped up to AAA next season, and possibly make an appearance for the big league club. Those three have been less than ideal returns for Texas’ former superstar Teixeira, but there were two more names, and they are big ones: Elvis Andrus and Neftali Feliz. Converted from being a starter, Feliz looked like a potential Rookie of the Year candidate with his 2010 season. His blistering fastball carried him to the elite level of closers at just 22 years of age. His 159 ERA+ produced a WAR of 1.8, behind only White Sox fireballer Matt Thornton and Kansas City’s Joakim Soria in terms of wins provided. That’s right–he even surpassed the great Mariano Rivera (1.7 WAR), and he helped send both Rivera and Teixeira packing last night, throwing a perfect ninth inning with two strikeouts and a fastball that registered as high as 100 MPH. Despite regressing in 2010, Elvis Andrus has been a stud in the playoffs. Meanwhile, his teammate Elvis Andrus wasn’t exactly a slouch, either. 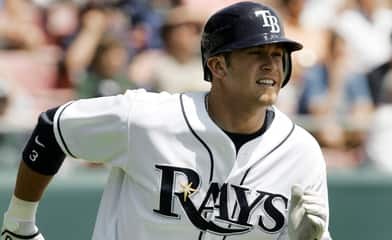 After stealing 33 of 39 bases in 2009, and posting an AL-best 13.5 UZR (among those who qualified), the young shortstop took both an offensive and defensive step backwards in his sophomore season. His OPS went from a decent .702 to an anemic .643, mostly due to putting zero fly balls over the fence in 2010, dropping his SLG from .373 to just .301. His baserunning suffered, managing just 32 steals in 47 attempts. The stellar defense regressed the most, though, as his UZR fell all the way to a 0.1. Regardless, his play in the postseason has been outstanding; he has managed to hit .333 and steal 7 bases in 8 attempts, including a perfect 4-4 against the Yankees. That pair of 22-year-old rising stars (born less than 6 months apart) has helped carry the Rangers in the postseason, and they are a big part of why Texas is sitting in the position that it is now–its first playoff series win, its first home playoff game win, and its first World Series birth, all in the same postseason. And it’s not just THAT Texas won; it’s also HOW the won. Game 6 was crucial, both in the sense of momentum, as well as in terms of rotation alignment. By winning against Yankees righty Phil Hughes, Texas now gets to guarantee a Game 1 start for Cliff Lee, something they will definitely need, whether they face two-time (soon-to-not-be) defending Cy Young award winner Tim Lincecum of the Giants, or if they get Lee’s 2009 squad, the Philadelphia Phillies, who could march out a man among men in Roy Halladay, who has managed a perfect game against Josh Johnson, a playoff career debut no-hitter against Cincinnati, and 20 wins–all in 2010, which will likely see him win the 2010 NL Cy Young. Rangers fans, remember who brought you Andrus and Feliz. So when all of you Rangers fans are watching Elvis Andrus swipe bases and Neftali Feliz turn the dial up to triple digits, remember to thank the former franchise first baseman that you thought scorned you, because he clearly left you a big present on his way out the door. Editor’s note: We are deeply sorry that Ron Mahay was not mentioned in this blog post. While Mahay was only a LOOGY who wasn’t good at anything else, he was probably extremely vital in a deal that featured Mark Teixeira. But we must not forget about Ron Mahay, for we do not want to offend him and his family/relatives by not giving him any credit for building this current Texas Rangers team. From the PTP^2 staff.